"Dr. Watson is an excellent surgeon and physician! I highly recommend him!" "Because of Dr. Lurie I can walk. He put both legs and one arm back together." "I refer Dr. Lurie to everyone. I had shoulder surgery and felt wonderful afterwards." "I had Dr. Lurie who I would definitely recommend. He did an excellent job." "I found Dr. Watson and his staff to be most helpful." 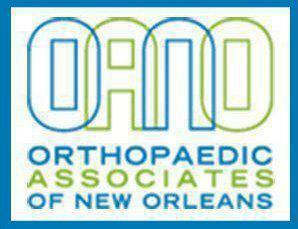 "I had a great experience with the Orthopaedic Associates of New Orleans." Excellent physicians excellent staff. Very professional." "They found a broken vertebrae in my back that another doctor didn't." "Dr. Ramirez was incredible, thorough, and kind." "Dr. Watson is aggressive with treatment but awesome with results. Thanks Dr. Watson." At Orthopaedic Associates of New Orleans, you’ll find a group of dedicated orthopaedic doctors offering an unparalleled level of skill and expertise. If you live in or near the metro New Orleans area and are searching for quality joint health services, you’ve come to the right place. The OANO medical team consists of board-certified surgeons who offer innovative care in arthroscopy, joint replacement, workers’ compensation, rotator cuff repair, diabetic foot care, and other orthopaedic needs. An excellent support team of nurses who are experienced in orthopaedic care assist these practitioners. The office runs smoothly, thanks to a fantastic management and patient services staff. As technology continues to change the face of medical care, the team at Orthopaedic Associates of New Orleans is committed to staying at the forefront of those developments. That’s especially true when it comes to arthroscopic techniques and tools, an area of orthopaedic practice that is truly exciting. Today’s approaches allow patients to achieve outstanding results with minimal recovery time and a lower risk of infection and pain. The Orthopaedic Associates of New Orleans office includes on-site X-ray capabilities, as well as convenient access to MRIs, CT scans, and other imaging options. Team members routinely pursue additional education on orthopaedic techniques, tools, and approaches. That dedication to continual skill refinement is one of the many reasons why a large number of men and women from the area entrust their joint care to OANO. To learn more about Orthopaedics Associates of New Orleans and the services offered, schedule an initial consultation at your earliest convenience. You can reach out to the office by phone, or use the simple online scheduling tool to book an appointment. Come prepared with questions, concerns, and information about your medical history, and we look forward to welcoming you to the OANO practice family. We work with the Holy Cross School and Delta Festival Ballet. "Dr. Estrada is very professional. I recommend friends and acquaintances visit the Orthopedic Associates of New Orleans." "Dr. Watson performed shoulder surgery on my rotator cuff and bicep. I would definitely recommend Dr. Watson and his team to anyone considering orthopedic surgery." "I have had two knee replacements. Excellent results! Doctors Estrada and Watson are top notch. Highly trained and caring staff as well." "Dr. Estrada, Donna, and Cherie were all wonderful. My issue was diagnosed and dealt with. My questions were answered." "Dr. Estrada operated on my husband's shoulder... he gave me a knee replacement which is healing extremely well. We have nothing but the highest praise for him." "Dr. Estrada and his staff totally rock. Caring and knowledgeable physician and staff! Changed my life!" "I am thrilled with the outcome and the speed of my recovery. Dr. Estrada performed the more advanced "anterior" method of hip replacement surgery." "I had Dr. Lurie, who I would definitely recommend, and heard great things about Dr. Estrada and Dr. Watson as well." "I was given exemplary service and attention from Dr. Estrada and his staff. Dr. Estrada himself is an effective listener and took time to tend to me." "The best decision I made was choosing to make Dr. Laurie my doctor. If you are looking for a orthopedic doctor then you have come to the right place." "Dr. Estrada has gave me a knee replacement which is healing extremely well. I encourage anyone to see Dr. Estrada." "Dr. Estrada, Donna and Cherie were all wonderful, professional, kind, attentive and present. They are great." "He was highly recommended from several sources and I totally agree! He has great bedside manor and spends adequate time for assessment and questions." "I have just set up a date for my second knee replacement with Dr. Estrada. He is very proficient at what he does." "My full tear rotator cuff surgery could not have gone any better! On the day of surgery Dr. Estrada and his staff made me feel very comfortable." "The best! In every way. Takes time with you, compassionate, friendly, and down to earth." "I was referred to Dr. Estrada for carpal tunnel surgery. Being a musician, I was concerned about the outcome. The surgery was such a success." "Dr. Lance Estrada is wonderful and great at what he does. My aunts were so impressed...they are now switching over to him." "Dr. Estrada has been my orthopedic surgeon for a number of years. He is a wonderful, superb physician. I cannot imagine ever having to see another orthopedic surgeon."